Follow an old pack horse trail that was used early in the 20th century to deliver mail between the two small Utah towns of Escalante and Boulder. Note: Some sections cross slickrock where the trail is marked with cairns. Route finding experience, topographic maps, and a GPS are recommended. 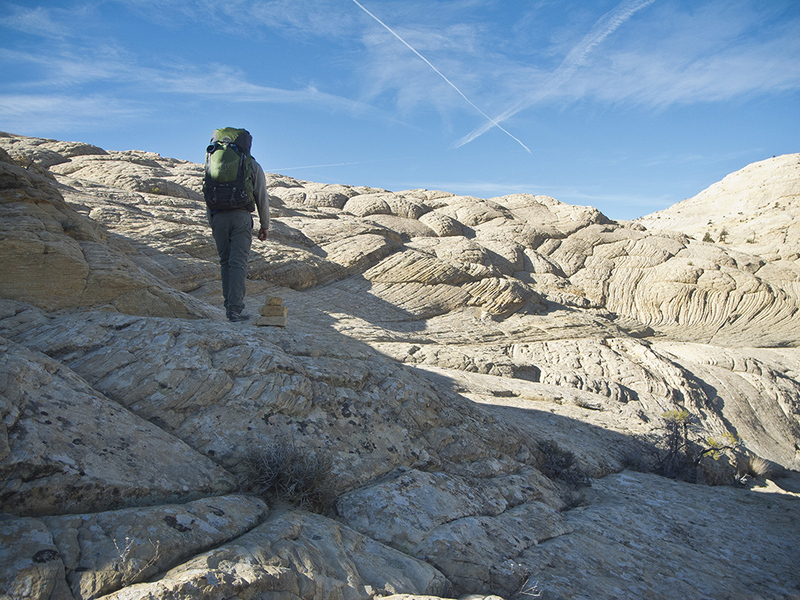 This hike is best suited for an overnight trip. For an excellent day hike, turn around at Death Hollow. The trail meanders across a sagebrush field dotted with piles of dark basalt boulders that washed down from the heights of Boulder Mountain. Geologists think the boulders were deposited here 60,000 to 150,000 years ago when the area was covered by glaciers. Pioneers named Boulder Mountain after these relics. The trail soon levels out and continues along a shallow drainage. Keep your eyes open for rock cairns marking the way. The drainage reaches a small pouroff, where the trail cuts left along a small sandstone ledge. The upper part of the slickrock canyon, visible just below the western horizon, is Death Hollow. The trail bends off to the south, climbing over a small saddle. McGath Point Bench is visible to the south. At about 1.6 miles, the trail drops off the rim and continues to descend. When you reach a second, more dramatic rim, the trail drops into a broad bowl of undulating slickrock dotted with junipers and ponderosa pines. Follow cairns to the bottom of the basin; the trail hooks left and takes you to the bright green vegetation growing along the banks of Sand Creek (about 2.7 miles from the trailhead). Follow the creek until the trail climbs out from the drainage on a steep slab of fractured slickrock. 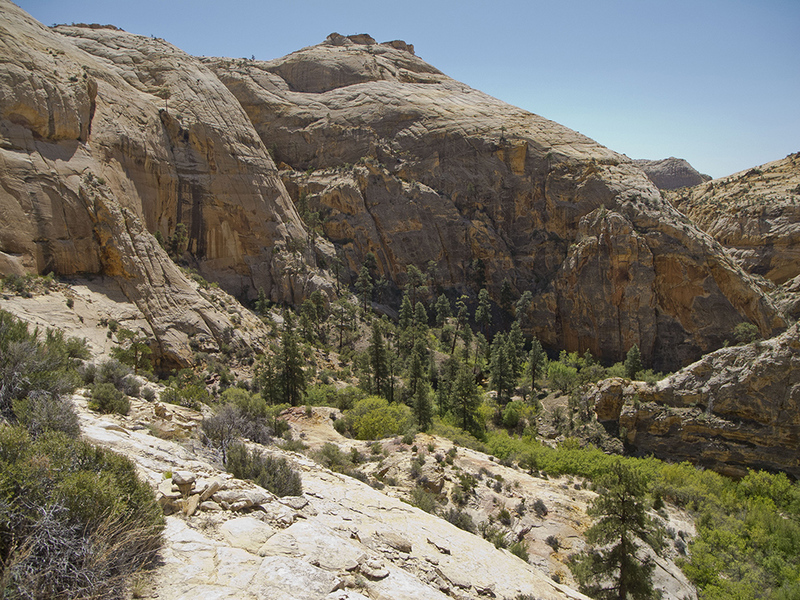 After gaining several hundred feet in elevation, the trail goes up a sandy ridge until it reaches an old galvanized wire running from tree to tree – the telephone line that ran from Escalante to Boulder. The hike more or less follows the telephone line the rest of the way. Next, the trail crosses Slickrock Saddle Bench, a flat, sandy, sagebrush-covered mesa that divides the Sand Creek and Death Hollow drainages. In a mile, you start to see the upper walls of Death Hollow. At about 5 miles, the trail drops down a gentle grade until you’re staring Death Hollow in the eye. The trail begins the 800-foot descent into Death Hollow by dropping into a broad slickrock basin. Bear right past excellent crossbedded walls and follow switchbacks down the incredibly steep face. Imagine leading horses down this route! The hacked-out steps you see provided better footing for the pack horses carrying the mail. Around 6 miles, you reach a green ribbon of lush growth and the bottom of Death Hollow. Turn left and follow the creek downstream past beautiful pools, tight meanders, and dense vegetation. Keep an eye on the right (east) side of the canyon for a cairn that marks your exit route, which is about three-quarters of a mile downcanyon. The route out of Death Hollow is just as steep as the descent. A few tight switchbacks take you up the initial climb, but the trail continues straight up along smooth slickrock until you reach the top of a sandy bench around 7.5 miles. The telephone line reappears, and the trail follows it across the piñon-studded flats all the way to Mamie Creek. Drop down into a slickrock basin, again following cairns to the bottom of the drainage. You may find pools of water here (don’t count on them as a reliable water source), along with several campsites. This is the half-way point of the hike, and the second half is even more demanding. Get ready for endless undulations and a knee-busting final descent. 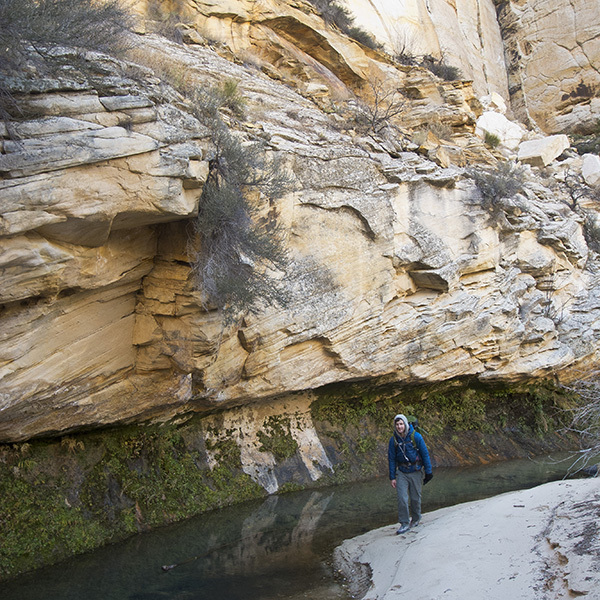 The trail climbs out of Mamie Creek a short ways downstream and continues up billows of Navajo Sandstone. It crosses another minor drainage and resumes the steep ascent up more slickrock. Just before you hit 10 miles, the trail turns south and levels into a broad, sandy bench. The telephone line marks the way across Antone Flat, disappearing again for a quick jaunt down a slickrock basin. From here, the trail climbs west up a sculpted drainage. You turn south again and cross yet another sandy, juniper - and sagebrush-covered bench, and you pass an interesting table-top outcrop of crossbedded sandstone. Around 12 miles, you catch your first glimpse of the town of Escalante and begin the final 1,100-foot descent. Head due west down a steep grade, pass a sculpted cascade of pools, and continue following the cairns. Enjoy a moment of knee relief when the trail levels briefly, but resume the downward trend zigzagging down the slickrock. Don’t be discouraged when the route climbs again – it’s an anthill compared to what you’ve done so far! Black basalt boulders reappear as you pass over a sandstone ridge. Descend the last steep slope to the sandy flats below. From here, follow the base of the sandstone ridge south along a dry wash. Pine Creek comes in from the right around 13.5 miles, and you follow it until you reach the Escalante River. Turn right, exiting the canyon and hiking towards Escalante town. 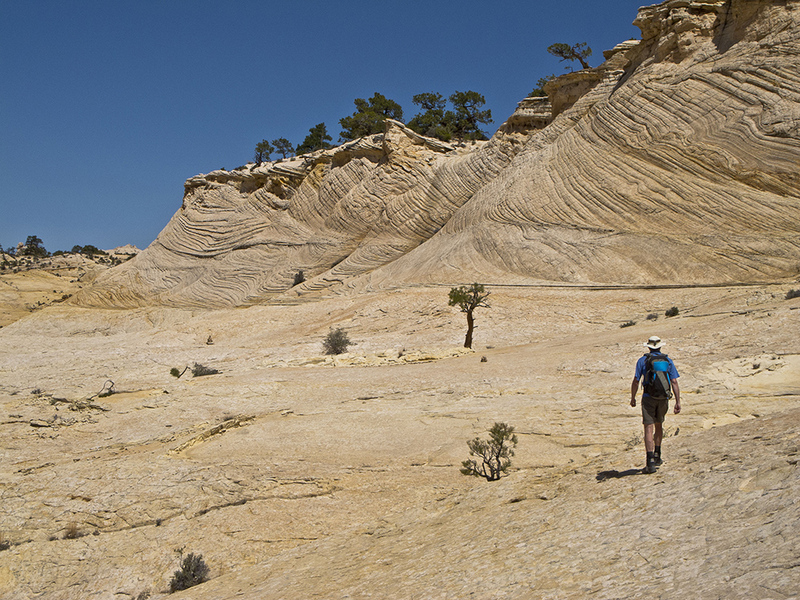 The trail leaves the Escalante River around 14.5 miles, passes through a wooden corral, and heads due south up shale hills. Reach the trailhead in another half mile. Presented here as a point-to-point hike, this requires setting up a shuttle with vehicles at the upper and lower ends of the trail. If you have neither the time nor vehicles to do this as a through hike, you can do an out-and-back day hike to Death Hollow, starting at the (upper) trailhead near Boulder. Upper Trailhead: From Boulder, Utah, drive west about three miles on UT 12 to the Hell’s Backbone road and turn right. In less than a half mile, turn left on a small dirt road that soon crosses a dirt airstrip. The road becomes rough and rocky after the airstrip. Continue down it for a few hundred feet to the trailhead sign. Lower Trailhead: From Escalante, Utah, drive east on UT 12 past Escalante High School. Following a BLM hiking sign, turn left towards the cemetery followed by a quick right. Head east on the dirt road for about a quarter mile and turn left. Continue for another quarter mile to the trailhead. 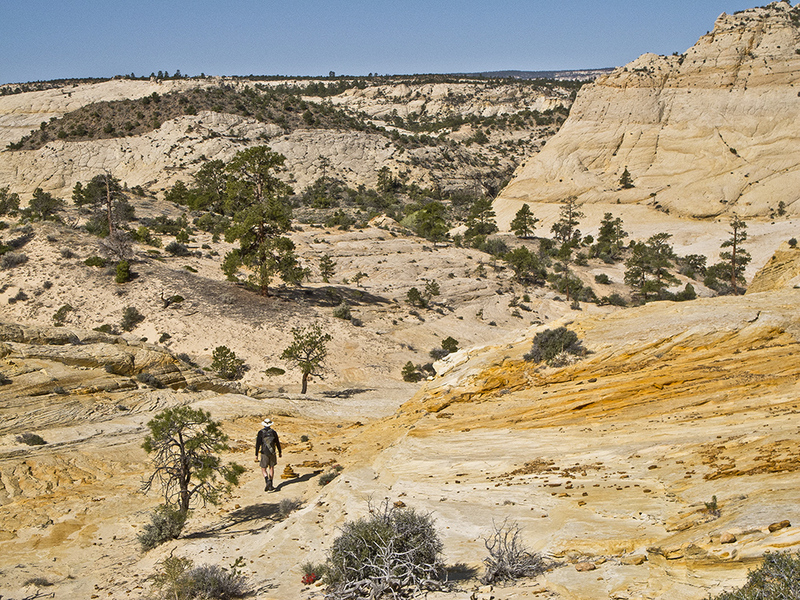 No fee – A free permit, available at any Grand Staircase-Escalante National Monument visitor center or developed trailhead, is required to camp at the trailhead or in the backcountry. Check the website listed below.